Ubit wireless network adapter is an product designed and developed considering on the growing needs of people who has urgent needs for an efficient working and life style. This product is much faster, safer and stable than other adapters. 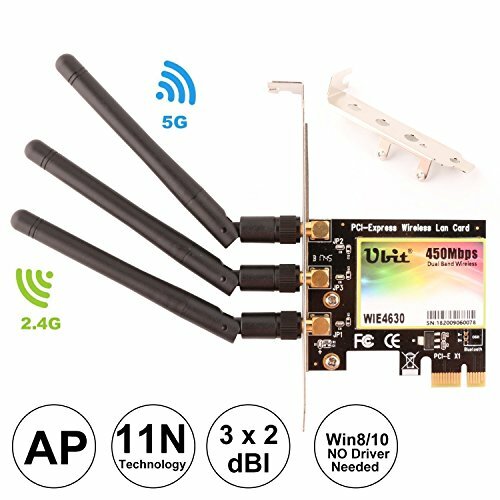 Wireless Dual Band (2.4GHz 450Mbps or 5GHz 450Mbps) PCI Express (PCIe) Wi-Fi Adapter Network Card With External Detachable Antennas Special Designed for Web Browsing, Online Gaming and HD Video Streaming, you can enjoy the ultra-fast experience. WIN 8,WIN 10 No drivers needed. No Need Driver on Windows10,Windows8.1,Wondows8(32/64bits). Need to Install driver on Windows7,Windows Vista, Windows XP (32/64bits). The WiFi Wireless Adapter Card only can insert PCI-E slot, not PCI slot. High-speed Connectivity. Add high speed 450Mbps Wi-Fi connectivity to a desktop computer through a PCI Express (PCIe 1X) slot. Allow PC connect to 2.4GHz or 5GHz wireless network. With latency as low as 5ms, you can watch HD video and enjoy multiplayer online games smoothly. The Wireless PCI Express Adapter provides wide compatibility, fitting with any standard PCI Express slot, x1, x2, x8, or x16. Compared with standard PCI network cards, it offers increased bandwidth, reliability and more functionality, allowing you to enjoy a fast and advanced connection. Built-in Intel 6300 chipset. Improving wireless network reliability and performance. No drivers needed, quick set-up, easy installation with bundled CD utility. The card motherboard features short circuit prevention design so you can reassure that it won't burn out the computer motherboard or PCI-E adapter. Dual Band Technology & 3-Antenna Design: Support dual band 2.4GHz and 5GHz channels for smoother HD video streaming, online gaming, and file sharing. Plus, it supports 3 antenna arrays, which means increased wireless coverage, strong Wi-Fi performance and Wi-Fi connection stability. Seamless connect to wireless 802.11 ac/a/b/g/n products. Support 450Mbps max throughput on 2.4GHz band or 5GHz band. Comply with WPA-PSK/WPA2-PSK WEP WPAWPA2 security protocol. If you have any questions about this product by Ubit, contact us by completing and submitting the form below. If you are looking for a specif part number, please include it with your message.